Ryan E. Miller, Troop 155, earns Eagle Scout Award Ryan E. Miller of Troop 155 was recognized for earning his Eagle Scout Award, Scouting’s highest rank, at Tecumseh Council Eagle Scout Recognition Banquet on Feb. 24. The annual banquet at the Soin Medical Center, Beavercreek, honors all scouts each year who achieve the Eagle Scout Award within Tecumseh Council, which consists of Champaign, Logan, Clark, Greene and Clinton counties. There were 65 members in the Eagle Scout Class of 2018 who each earned 21 merit badges, 12 of which are required for this rank, completed an approved service project, and passed a board of review. Ryan is the son of Loran and Penny Miller (pictured) who have been Cub Scout leaders in Pack 155 for many years. 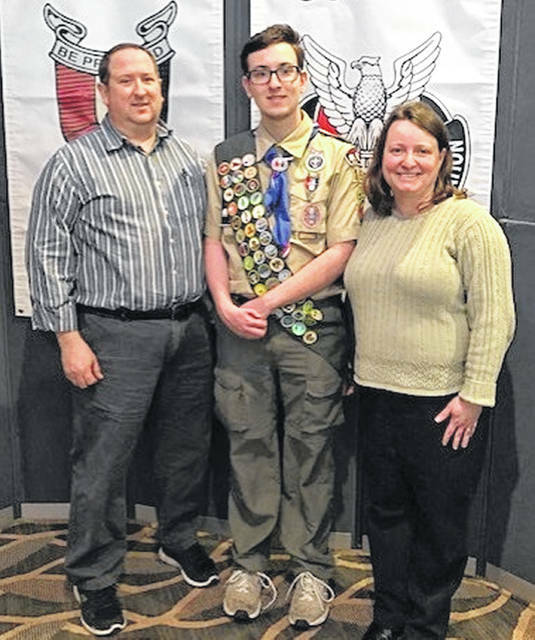 Ryan E. Miller of Troop 155 was recognized for earning his Eagle Scout Award, Scouting’s highest rank, at Tecumseh Council Eagle Scout Recognition Banquet on Feb. 24. The annual banquet at the Soin Medical Center, Beavercreek, honors all scouts each year who achieve the Eagle Scout Award within Tecumseh Council, which consists of Champaign, Logan, Clark, Greene and Clinton counties. There were 65 members in the Eagle Scout Class of 2018 who each earned 21 merit badges, 12 of which are required for this rank, completed an approved service project, and passed a board of review. Ryan is the son of Loran and Penny Miller (pictured) who have been Cub Scout leaders in Pack 155 for many years.